Hello friend! I hope you’re having a beautiful Spring! I just got home from Saskatoon and now I get to enjoy the budding leaves and bright yellow dandelions (they’re bee food so don’t get rid of them!) of the East Coast! With spring in the air and summer not far behind, it’s almost time for my favourite season of all: BERRIES!! While I am a huge fan of just eating my berries straight by the handful and shovelling them unceremoniously into my face, sometimes it’s nice to jazz things up a bit. When berries are in season it’s easy to get overzealous and end up buying WAY more than any one person would ever need. And it was after just such an event that this recipe was created. I’m always searching for ways to combine my favourite foods into delicious desserts that won’t spike my blood sugar and wreak havoc on my metabolism. 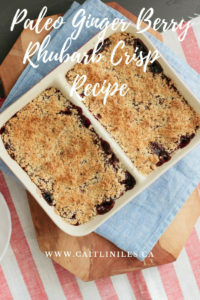 This recipe uses very little sugar, only 1/2 cup coconut palm sugar in the topping to be exact, and relies on the natural sweetness of the berries, spices, and nuts. It also avoids all grains, making it completely paleo-friendly and perfect for those who are healing a leaky gut or looking to lower their inflammation. Plus this recipe is totally vegan, which makes it the perfect addition to any dinner party or event to which lots of people with lots of different dietary restrictions or preferences will be going. One of my pet peeves is when food bloggers write gigantic posts before their recipes, so I’m going to cut myself off right here and let you get to the goods! Enjoy! This recipe is one of my favourites. A delicious combination of fresh berries, spicy ginger, and crunchy topping perfect for cool evenings slathered in dairy-free ice cream or coconut milk whipped cream! 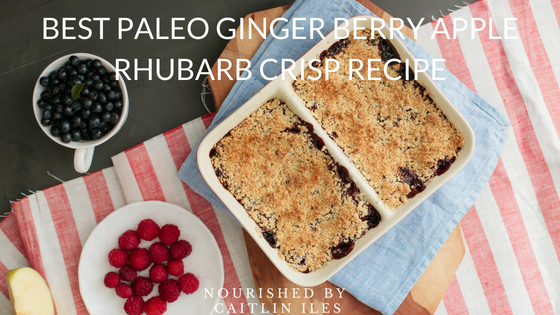 1 cup diced apples can sub with extra rhubarb! Grease a 12×6-baking dish with coconut oil. In a mixing bowl combine apple, rhubarb, and berries together. In a small bowl stir together all spices, vanilla, lemon juice, & tapioca starch from base ingredient listing until combined. Toss apples and berries in spice mix until fully coated then press into the baking dish. In a mixing bowl combine all ingredients from coconut flour to sea salt together. Add coconut oil and vanilla then massage with your hands until oil is fully incorporated and the mixture sticks slightly when compressed. Spread topping mixture onto fruit layer, firmly pressing down. Place in oven for 45 to 50 minutes until fruit is softened and topping is toasted brown around the edges. That’s all for today friend! Thanks for stopping by! What happened to adding the rhubarb?? ?